Are You Making These 11 Cold Email Mistakes? If you’re making these COMMON cold email mistakes, you’re going to ruin any chance you have at success. If you have a well-crafted message, cold email is a great way to generate leads. But NOT if you are making these common cold email mistakes! Sending one of these common templates might immediately repulse your prospect. To understand the psychology at play with this example, put yourself in the shoes of the recipient. You get between 50-200 emails per day. On top of your proactive workload. Right when you see the first sentence, especially if you are viewing on mobile, you immediately know you can skip this email. This is one of the biggest cold email mistakes on this list. You know this is someone that you don’t know, and is going to sell you something. Don’t make it easy for your prospects to skip your email! How much of that email did you actually read? My guess is not much. And neither did your prospect, if you wrote a selfish essay like this. These kind of cold email mistakes will cost you sales. Avoid generic, rambling descriptions like this if you want to generate any type of response to your cold emails. Focus on what your prospect is interested in, and invite her into a conversation around that specific topic. People like when you talk to them like a real person. When you throw a lot of generic marketing talk at them, they tune out. 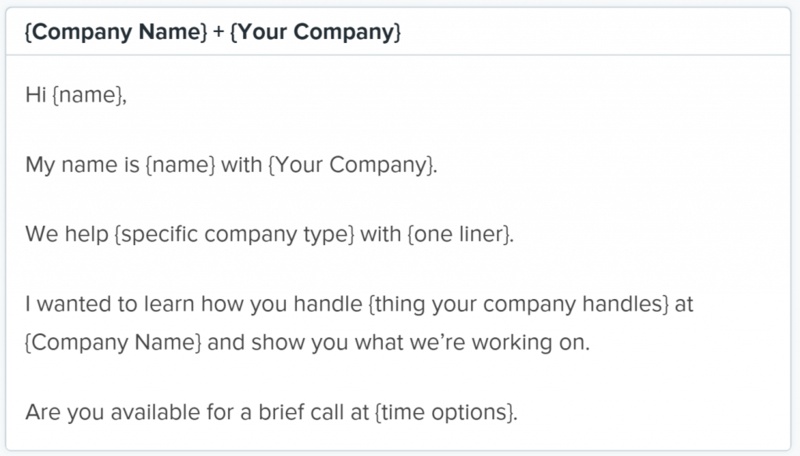 Write your cold email like you talk. Your prospects will respond to your better. Here are 11 general principles you want to avoid with your cold email outreach. They don’t care about how you are and your company. All they ultimately care about is how your offering helps them. Ideally, they care most about saving time, saving money, or making money. So try and frame your email to cater to those needs. The first sentence in a cold email is critical as that’s what they see in their email preview panes. Trying to mislead them, or just not putting any thought into the subject line will kill your open rates. Your subject line needs to relate to what your email is about, but it needs still appeal to them enough to get them to open it. Spend the time in really trying to craft a great subject line. If all else fails, something like “Quick Question” or “Strange Question” works pretty well, though it isn’t quite related. If you use this subject line, you better be sure it really is a quick question and a short email overall. When you are passionate about what you offer, it is hard to really just strip things down to the basics. You want to really make sure you show them all the different ways you can help them. Focus on a single benefit. You can focus on other benefits in follow-ups if needed. By trying to sound too professional, you end up sounding like a robot. People don’t talk in a series of multiple syllable words. A good rule of thumb is to write your emails like you would if you were having a face-to-face meeting with them. Have someone else read it out loud back to you to get a sense of how it flows. I usually see people use too many exclamations. I’ve seen an email where every single sentence inside the email ended with an exclamation. You might think it’s driving home the point, but it’s really just putting up a flag that says this is all hyperbole. 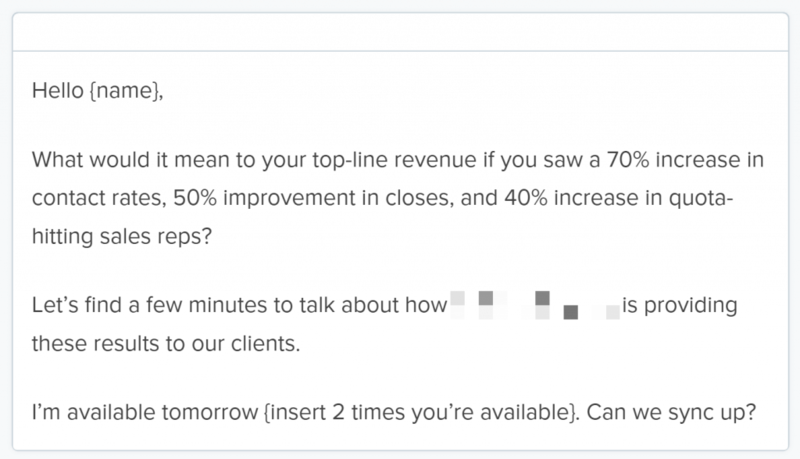 You don’t want to feel like you’re going to miss out on converting them if your primary call to action misses the mark so you ask for 15 minutes, you ask for a reply to a question, and you try getting them to download your super awesome white paper. Focus on getting them to do one thing per email. Otherwise, they won’t do anything. Nothing can ruin your cold email outreach campaigns quite like having spelling and/or grammar mistakes. This wreaks of amateurism and is going to be a major turn off. Make sure you’re emails are spell checked and have someone else proofread it. Using your address and phone number helps build credibility that you’re a real business. Never mind the fact that you need to do this legally anyway. In addition, providing an image of yourself helps put a real person’s face to the email. If you’ve won awards or have awesome testimonials, try and incorporate them somehow below the email signature. You are going to get responses from people that get upset you are emailing them. This happens and you just have to move on. If you are somehow offending people with your message, or getting people very irate, then you will want to evaluate how your message is being perceived and make adjustments as necessary. For the people that just don’t want you to contact them, great…move on. This is actually a good thing because it means they didn’t flag you as spam and you don’t have to worry about spending the time to send them another message. You just send one email and assume they’re not interested if they don’t respond. Although, this is logical, it can be detrimental to your lead generation efforts. Initially, they will feel like they somehow got on a list or you’re sending them a blanket email. When you follow-up with them, they start to understand that you’re contacting them directly and you feel like you can help them specifically. You need to dedicate some time every single day to performing outreach for you to have measurable results. Even if one day you only send one or two, it’s better than nothing. Try to keep a tally so you start building momentum and more pressure on yourself to keep the streak alive. Although cold email outreach isn’t SPAM, it can sure feel like it to your prospective customers if you aren’t doing it right. Try to avoid the 11 mistakes outlined above when you’re doing your cold email outreach. How many cold emails per day, should you send? There are limitations on how many emails your email client will allow you to send. You don’t want to look like spam, otherwise other emails that you send could be blocked and that’s no good. The rule is no more than 200 cold emails per day should be sent. Beside being an inexpensive method to meet new people valuable to your business, cold emails are a great tool to introduce your company to potential clients. You can introduce your products, services and skills to other business owners who might be interested in doing business with you. Furthermore, if done right, cold emails can be a valuable foundation to creating and building fruitful business relations in the future. Using an appropriate cold email subject line can help you attract the attention of a potential client which may lead to a positive response. Once you start networking, your online communication can serve as a base for developing a solid business partnership further on. Another important advantage of cold emails is that they provide you with a great opportunity to clearly target your potential clients. When writing and sending cold emails to people, you can choose exactly who will receive your offers. By contacting the right people, you can focus solely on the individuals who can be of great importance to your business. Taking into consideration all of the important benefits of cold emails, it is clear why many entrepreneurs are have found them to be effective as part of a full marketing campaign. However these are many traps along the way. Businesses exist because they have something to offer. 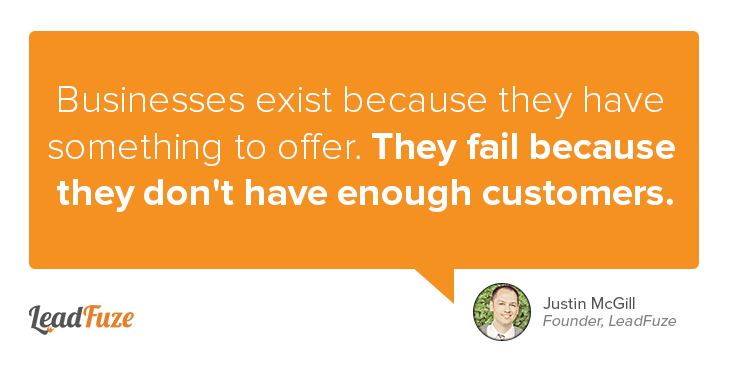 They fail because they don’t have enough customers. Lead generation is a broad and very tedious task. However, a business’s life depends on having customers. If your lead flow is looking bleak, then these are probably the reasons as to why. Shooting in the dark and trying 10 different things at once isn’t going to move you forward. Try one or two lead generation strategies at a time and then figure out which, if any, is working. Give the results some time to work themselves out and then dump the tactics that aren’t generating leads. Don’t try something for a day and then determine if it worked. Sending a direct mail piece once, or making one initial outreach email to 20 or 30 people and not getting a response, does not mean that the tactic won’t work for you. You might need to refine your message, you need follow ups, etc. “Just checking in” emails don’t count. You need to have a worthwhile follow-up that pulls them closer into your world. Nearly 85% of all our lead generation efforts actually come from follow-up responses, not the initial outreach message. Don’t try to appeal to everyone. By focusing on a specific industry, it doesn’t mean you are closing the door on all other companies. It just allows you to focus your marketing and your messages to a very specific target. This will help resonate with that audience much than if you try to be everything to everyone. If you try to appeal to all businesses, then you appeal to no businesses. A landing page for a specific industry will really lend credibility for your target market. At the same time, it allows you to speak in their terms which helps them resonate with your messaging. Try and direct your outreach to a landing page that will make sense for your target market. Even better if it is dedicated especially to their vertical. Here’s a great breakdown comparing two of the leading landing page builders if you need help putting this together. It is almost better for you to give your pitch to someone outside your company and then have them put it in their own words. Use what they say and write as your message. With LeadFuze for example, we don’t let our customers write their own email sequence. We let them have final approval, but we don’t let them write it because they are going to want to go on and on and on about how great they are. Your prospects don’t care about how good you are, they care about how you’re going to help them. If doing email outreach, keep it to two to four sentences. If you’re calling on leads, don’t be afraid to ask questions and get them engaged. You should never give prospects hypothetical situations. “If your company does this, if you wanted to do that…” if you’re asking the right questions and engaging them…you’ll know exactly what and how they do things. You can then tailor your message to THEIR needs, not your rambling sales pitch. Newsflash…your prospects don’t care who you are or even what you do. They care about how you can help them with their problems. If you’re doing email outreach, don’t even bother introducing yourself. Just get to the point. If you don’t have a presence online or at least within your local community, you are fighting an uphill battle. Work on establishing credibility for your business before you try focusing heavily on lead generation. Build up some content, speak wherever you can, guest post, offer white papers, etc. If you aren’t investing in content creation, then you don’t have anything to nurture your leads. By investing in content, you not only can leverage this on the front end with lead generation, but you can keep top of mind of existing leads in your pipeline. The beautiful thing with lead nurturing is, you don’t need to keep following up with them if you’re pushing regular content to them. Even if you are putting together content, if you don’t have a CRM and/or some other system of managing your leads then you will undoubtedly have qualified leads slip through the cracks. This means your tactics are making you work, not working for you. Using something like LeadFuze can automate your email outreach. Having systems in place for like a CRM and lead nurturing allow you to take prospects all the way through your funnel with minimal management on your behalf. If you have lead generation channels that are working, why are they working? What methods within that process can you automate? This is the most important. As I mentioned in the third point above, nearly 85% of all our leads are being generated after the first follow-up message has been sent. That means only close to 15% of the leads we have generated have come from the initial email outreach. How many times are you following up? Even though cold emailing is a great method to reach out to potential clients, there are a few directives to follow, to ensure positive results. Since your email should engage the recipient in a matter of seconds, it should have a personal tone. If it sounds too formal, your cold email will get a cold response – and you definitely don’t want that. Successful business people receive numerous emails on a daily basis, so you want to stand out. The best way to add a personal touch to your cold emails and make them more credible is by adding a signature head-shot. Once you add your head-shot at the end of your message, the recipient will remember you and your offers more easily. In order to achieve positive results and maximize the impact of your cold emails, it is necessary to learn the company’s hierarchy. Get well informed about the decision makers in the company, prior to sending your cold email. Unless your message is received by the right person, your chances of success will be minor. If you want to receive a response from the company’s CEO, don’t bother sending a cold email to the IT manager or sales agents. Doing this is actually one of the major cold email mistakes most people make. Therefore, it is always good to do some research before sending your cold emails. Furthermore, getting informed about your potential clients’ needs is essential. If you know that the company you are contacting is in need of an expert like yourself, make sure you include that in your cold email. Politely offering your expertise or services to the relevant company in your business field, at the right time, is certainly a winning approach. Last but not least, it is important not to get discouraged. Sometimes, it may take more than two or three cold emails to get someone’s attention, and there are also times when you won’t get any positive responses whatsoever. Nevertheless, sending cold emails is always worth a try. After all, you have nothing to lose and a lot to gain, so why not give it a shot? Want more leads? First, make sure you aren’t falling into the cold email mistakes above. Secondly, focus on a channel that is working and do everything you can to systematize the process so you can put that on autopilot while you work out your next lead generation strategy. Josh Slone is the Head Content Writer for LeadFuze. 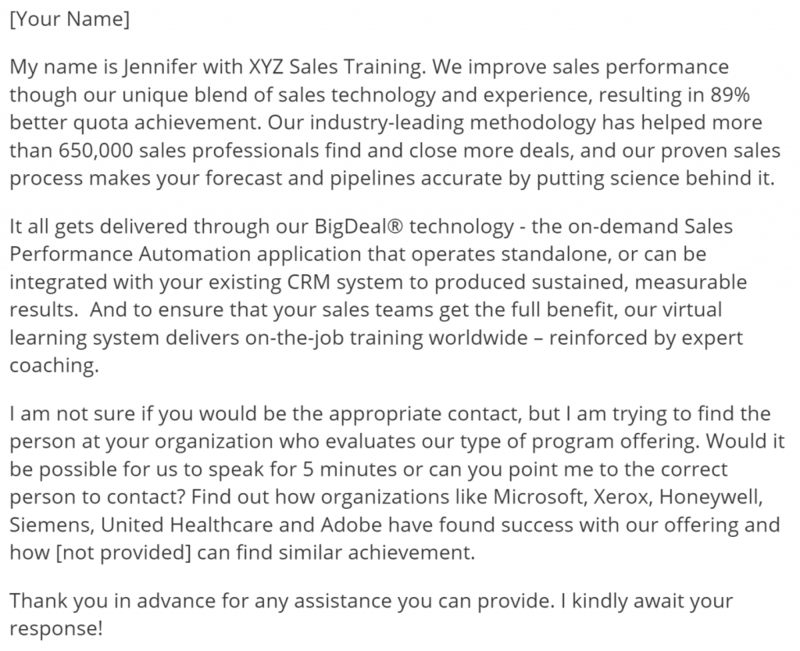 Josh writes about lead generation strategies, sales skills, and sales terminology. Yup, writing cold email is hard. And even harder when you want to stay relevant on the 2nd, 3rd, 4th followup. Recently I started playing with a free tool that helps create a 5 touch campaign by starting with a buyer persona, and getting in the mind of the customer as you described. Hmmm, I think 3 and 5 were my mistakes doing cold email for my SEO services. I would try cold email again with this learning! Thank you Micheal for this awesome article. How many emails do you recommend sending and do you have any idea to get email leads? LeadFuze gives you contact information for your ideal leads. Find leads instantly! LeadFuze is a lead generation software that aggregates the world's professional data and the companies they work for, to give you an easy way to build the most targeted, and accurate list of leads imaginable. Find anyone’s contact information in your target market with unlimited access. LeadFuze aggregates the world’s professional data to continue to deliver the freshest leads to you. Start building your dream list today!